The truth is that the early symptoms of pregnancy with twins aren’t always scientific. In some cases it is just a hunch that women have. Nonetheless there are some symptoms as well indicating a multiple pregnancy backed up by science. Women often feel that the pregnancy symptoms that they have are more severe than the symptoms of women having a singleton pregnancy. This means that the breasts are more tender, you have to urinate more frequently, you feel more fatigued and the morning sickness is worse. 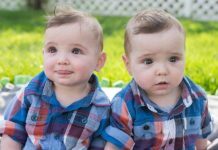 As it has been mentioned before, the early signs of pregnancy with twins aren’t always scientific. Sometimes women just know that they will have twins. Although the scientists can’t really explain this, there is no reason to doubt the fact that women know their body the best. When it comes to the early symptoms of pregnancy with twins, it is a known fact that women don’t gain too much weight in the first trimester. However the women carrying twins can gain more weight. This symptom is accompanied by the fact that the doctor tells you your uterus is relatively large for your gestational age. 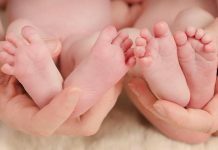 The women thinking about the early twin pregnancy symptoms should know that women pregnant with twins often have relatively high levels of AFP or alpha fetoprotein. Besides this, these women also have higher hCG levels. This is produced by the placenta. In order to find the early symptoms of pregnancy with twins, you will have to listen to your body. Women often say that their heartbeat is as fast as if they were constantly exercising, rapid heartbeat being one of the sings that in a short while you will have twins. The more reliable early twin pregnancy signs include the doctor finding multiple heartbeats. This symptom is usually found during the 12th week of pregnancy during a Doppler test. You could also have an ultrasound to find out whether you carry twins or not. If you have an ultrasound around the 6th week of pregnancy a skilled technician may be able to find two sacs and two embryos. As you can see there are some objective early symptoms of pregnancy with twins, but in many cases women can’t really explain how they know that they will have twins; they just know. This is what we call female intuition.